Wellens' syndrome: This is characterized by symmetrical T-wave inversion in the precordial leads during the chest pain free periods in the setting of ACS. This occurs without Q waves,o ST-elevation. The cardiac enzymes are not or minimally elevated. During the chest pain episoes, this T-wave inversion may be normalized (pseudonormalization). The presence of Weelens' syndrome indicates the presence of critical lesion in the proximal segment of the left anterior descending artery (LAD). Early intervention is advised in this settings. De Winter's T waves: This is charachterized by an upsloping ST depression (>1mm at J point) followed by a tall symmetric T-wave. This was present in precordial leads. It is associated with 0.5-1 mm elevation in aVR. This pattern is present in 2% of anterior MI. It may precede or follow the usual pattern of anterior STEMI. It was associated with LAD occlusion. Presence of this sign should prompt activation of cathlab immediately. aVR - Does it have any diagnostic value? Actually it has. In the setting of diffuse ST-depression (more than 7 of the other11 leads), ST elevation in the aVR indicates the presence of either left main coronary stenosis or multivessel disease. Localization of the culprit leion in the setting of inferior STEMI: You may compare the amplitude of ST-segment elevation in the inferior leads. If the highest elevation is in the lead II, LCX occlusion is expected. If lead III shows the highest ST-segment elevation, RCA occlusion is more common. Acute MI with LBBB: We all know that LBBB causes changes in ST-segment, rendering the diagnosis of STEMI difficult. some useful tips are presented here. Actually new LBBB in the setting of STEMI is the result of proximal total occlusion of LAD or left main coronary artery occlusion. These are sites of obstruction before the 1st septal branch that supplies the left bundle branch. An infarction due to occlusion in this site is usually associated with severe pain and hemodynamic compromise due to large area of infarction involved. Those patients may present with acute heart failure or cardiogenic shock. The interpretation of ECG with understanding this clinical tips is somewhat helpful in making the diagnosis. 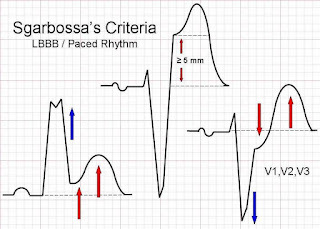 Another point is the Sgarbossa diagnostic criteria. concordant ST elevation >1mm is given 5 points. Concordant ST depression >1mm is given 3 points. Discordant ST elevation >5mm is given 2 points. The higher the Sgarbossa score the patient hasm the more likely he has a myocardial infarction. However, Dr. Smith has found some modification on these criteria to be more useful. He suugested that the discordant ST elevation to be considered positive if it reaches >25% of the depth of the preceding S wave. After coronary reprefusion we should monitor for the signs of myocardial reperfusion, one of which is reperfusion arrhythmias. The most specific arrhythmia for reperfusion is accelerated idioventricular rhythm, also known as slow VT. 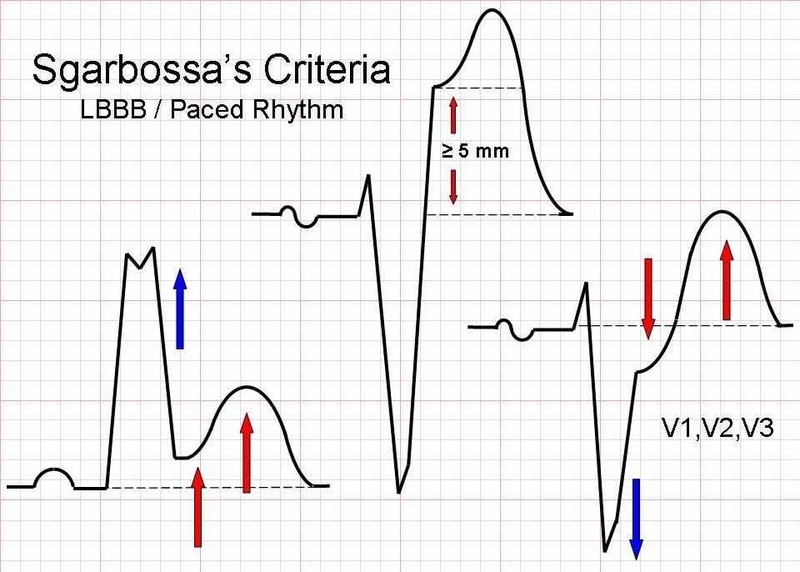 It is a ventricular rhythm at rate of 60-120 bpm.